The victim reportedly rammed a Ceres bus from behind in Pilar on Monday afternoon. Two units of the Southern Star Bus Transit Inc. figured in separate accidents on a rainy afternoon yesterday. No fatalities were reported but three motorcycle-riding men were injured during the accidents in Duero and Pilar, while none onboard the Ceres buses were hurt. Authorities identified the victims in Duero as Joseph Gamutan, the driver, and his passenger as Tom Collins Hera, while police in Pilar noted that the injured motorcyclist in Pilar is a 14-year-old male. Based on initial investigation of the Duero police, Gamutan accidentally crossed to the opposite lane as he made a sharp turn in Barangay Guinsularan on their way to Guindulman at around 3 p.m. Meanwhile, the Ceres bus was on the other lane heading towards the opposite direction leading to a head-on collision between the vehicles resulting to the severe injuries of Gamutan and Collins. Gamutan reportedly was unable to return to his lane due to the slippery road. 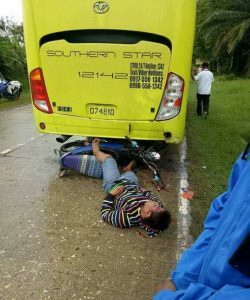 Two hours prior to the Guindulman incident, a 14-year-old male resident of Talibon was also injured after the motorcycle he was driving rammed a Ceres bus from behind. According to police, the victim was trailing the bus as he was heading towards Alicia. The Ceres unit then reportedly made an abrupt stop causing the victim to slam into the bus. Based on police investigation, the motorcycle was unable to stop on time partly due to the slippery road.